Trust the luck and keep your powder dry. How can each of these help companies to make sales forecasts? The purpose of this unit is to introduce the subject of finance and accounts by looking at some basic principles behind this area. One of the biggest problems faced in dealing with accounts and finance is the terminology that is used and the fear with which people approach the idea of manipulating numbers, especially with regard to ratio analysis and using balance sheets and profit and loss accounts. In this unit, therefore, will look at the profit and loss account and the balance sheet and attempt to distinguish between the two and to offer the opportunity for some preliminary analysis. These financial terms definitions are for the most commonly used UK financial terms and ratios. They are based on UK Company Balance Sheet, Profit and Loss Account, and Cashflow Statement conventions. - balance sheet: It is a 'snapshot' in time of who owns what in the company, and what assets and debts represent the value of the company. - budget: in a financial planning context the word 'budget' (as a noun) strictly speaking means an amount of money that is planned to spend on a particularly activity or resource, usually over a trading year, although budgets apply to shorter and longer periods. A 'forecast' in certain contexts means the same as a budget - either a planned individual activity/resource cost, or a whole business/ corporate/organizational plan. In other words, budget = plan or a cost element within a plan; forecast = updated budget or plan. - The movement of cash in and out of a business from day-to-day direct trading and other non-trading or indirect effects, such as capital expenditure, tax and dividend payments. The cashflow statement shows the movement and availability of cash through and to the business over a given period, certainly for a trading year, and often also monthly and cumulatively. - current assets: cash and anything that is expected to be converted into cash within twelve months of the balance sheet date. - current ratio: the relationship between current assets and current liabilities, indicating the liquidity of a business, ie its ability to meet its short-term obligations. Also referred to as the Liquidity Ratio. - current liabilities: money owed by the business that is generally due for payment within 12 months of balance sheet date. Examples: creditors, bank overdraft, taxation. 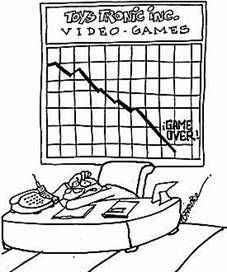 - depreciation: the apportionment of cost of a (usually large) capital item over an agreed period, (based on life expectancy or obsolescence). - fixed assets: assets held for use by the business rather than for sale or conversion into cash, eg, fixtures and fittings, equipment, buildings. - fixed cost: a cost which does not vary with changing sales or production volumes, eg, building lease costs, permanent staff wages, rates, depreciation of capital items. - FOB - 'free on board': The FOB (Free On Board) abbreviation is an import/export term relating to the point at which responsibility for goods passes from seller (exporter) to buyer (importer). - gearing: the ratio of debt to equity, usually the relationship between long-term borrowings and shareholders' funds. - goodwill: any surplus money paid to acquire a company that exceeds its net tangible assets value. - gross profit: sales less cost of goods or services sold. Also referred to as gross profit margin, or gross profit, and often abbreviated to simply 'margin'. See also 'net profit'. - liabilities: general term for what the business owes. Liabilities are long-term loans of the type used to finance the business and short-term debts or money owing as a result of trading activities to date. Long-term liabilities, along with Share Capital and Reserves make up one side of the balance sheet equation showing where the money came from. The other side of the balance sheet will show Current Liabilities along with various Assets, showing where the money is now. - net assets (also called total net assets): total assets (fixed and current) less current liabilities and long-term liabilities that have not been capitalised (eg, short-term loans). - net present value (npv): NPV is a significant measurement in business investment decisions. NPV is essentially a measurement of all future cashflow (revenues minus costs, also referred to as net benefits) that will be derived from a particular investment, minus the cost of the investment. - net profit: it can mean different things so it always needs clarifying. Net strictly means 'after all deductions' (as opposed to just certain deductions used to arrive at a gross profit or margin). Net profit normally refers to profit after deduction of all operating expenses, notably after deduction of fixed costs or fixed overheads. - profit and loss account (P&L): it is essentially a trading account for a period, usually a year, but also can be monthly and cumulative. It shows profit performance, which often has little to do with cash, stocks and assets (which must be viewed from a separate perspective using balance sheet and cashflow statement). The P&L typically shows sales revenues, cost of sales/cost of goods sold, generally a gross profit margin (sometimes called 'contribution'), fixed overheads and or operating expenses, and then a profit before tax figure (PBT). - overhead: an expense that cannot be attributed to any one single part of the company's activities. - reserves: the accumulated and retained difference between profits and losses year on year since the company's formation. - return on capital employed (ROCE): a fundamental financial performance measure. A percentage figure representing profit before interest against the money that is invested in the business. (profit before interest and tax/capital employed x 100). - share capital: the balance sheet nominal value paid into the company by shareholders at the time(s) shares were issued. - shareholders' funds: a measure of the shareholders' total interest in the company represented by the total share capital plus reserves. - variable cost: a cost which varies with sales or operational volumes, eg materials, fuel, commission payments. - working capital: current assets less current liabilities, representing the required investment, continually circulating, to finance stock, debtors, and work in progress. This account (P&L) can be updated regularly and shows how much profit or loss a business is making. The top section of a P&L account is known as the trading account for a business that buys and sells items e.g. a record store. What is known as the gross profit is calculated by deducting cost of sales from turnover. We now need to examine the next part of the P&L account. As well as the cost of sales, a business will incur overhead costs. These costs can’t directly be related to each unit of output made or sold - hence the name overheads. Overheads are typically referred to as expenses in the P&L account. Typical expenses for a business include items such as heating and lighting costs, as well as insurance and advertising. General administrative costs of running a business appear as administrative expenses. 1. Internally (inside the business) from capital raised from the business owners (the shareholders in the case of a company). 2. Externally - for example, in the form of loans, and other forms of finance which will need to be repaid. When you set up a business, the business become a legal body in its own right. Internal finance (shareholders' funds) is owed to shareholders. External finance is owed to people outside the business - liabilities. The balance sheet will therefore balance because, in simple terms it shows that the value of a businesses assets is financed by the two groups - 1.Internal (owner's capital), 2.External (liabilities). A balance sheet typically appears in a vertical format. The balance sheet starts off by listing all the assets. Next, come the liabilities. Finally, the owners' capital is shown - to balance the balance sheet. This is what a typical Balance Sheet looks like. What does the balance sheet show? The fixed assets show assets that will be kept in the business to generate wealth for the company over a period of time e.g. machines, computers and buildings. In contrast, the current assets are turned into cash in the short period. For example, a trading company will buy stock, which it then sells on credit. When the debtors pay up, they will pay in cash. This cash can then be used to buy more stock. Creditors due within one year, shows the short-term liabilities of the business, i.e. money that the company must pay within the next twelve months. Net current assets shows the current assets minus the current liabilities. It is important to have enough current assets (money coming in the short period) to pay short-term creditors (short term liabilities). In the example shown the current assets are €2,000 and the current liabilities are €1,000. Therefore net current assets = €1,000. Creditors due after more than one year are the longer-term liabilities of the business, for example long-term bank loans and mortgage repayments. The total net assets of the business is calculated by taking away all the liabilities (short and long term) from all of the assets (short and long term). Total net assets = (Fixed assets Current assets) - (Current liabilities long-term liabilities). Finally the Balance Sheet is balanced. 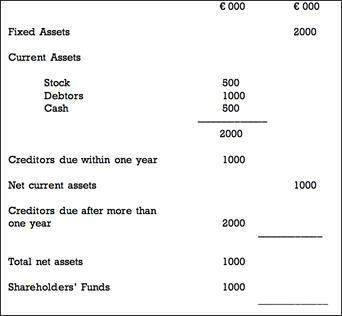 The Total Net Assets figure is €1000 (i.e. assets are greater than liabilities by €1000). The assets that are not financed by external liabilities are financed by the owners - therefore the owners' capital is €1000. On a balance sheet, things that you OWN are called assets/liabilities and the things that you OWE are called assets/liabilities. If working capital = current assets – current liabilities, why is working capital important to a business?